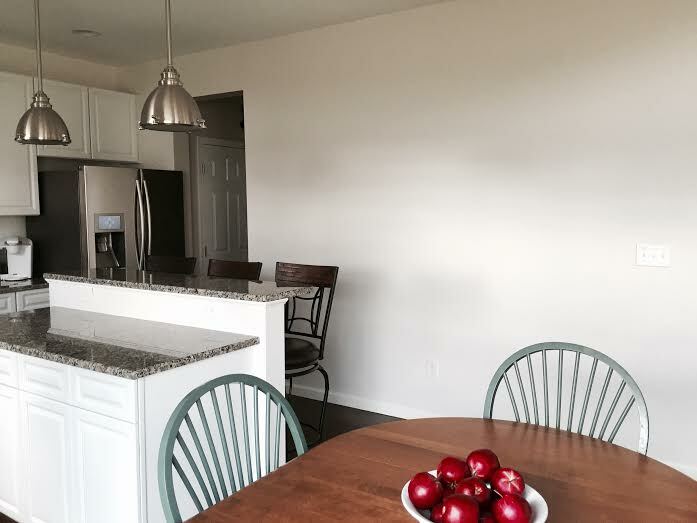 When going over the plans for our new home my husband and I decided against adding an additional cabinet arrangement or desk area on the long wall behind our island. This allowed for us to put money into other upgrades in the kitchen. One upgrade we splurged on was turning our island into a raised breakfast bar. I'm so glad we decided to do this because I absolutely love it. The raised breakfast bar adds additional seating and can comfortably fit three bar stools. Since we moved in 3 months ago, the wall behind the stools served as a blank canvas...until now. This past Saturday after taking Emy to gymnastics, I found myself at Target. If you're anything like me you can't go to Target and leave empty handed. And on this particular trip, leave empty handed I did not. I walked directly to the home decor section of the store and immediately found my first item for the wall, an extra large chalkboard framed in a graywash frame. I had spotted this piece a few weeks back and luckily it was still there. Upon trying to fit the chalkboard into the cart, I quickly realized that it was not going to fit with Emy sitting in the front of the cart. I took her out of the cart, wiggled the chalkboard into place, and prayed that both the chalkboard and my two year old behaved. After about 20 minutes or so I was able to locate a few more pieces. And of course, no trip to Target is complete without a stop at Starbucks. I left the store with a sleepy toddler, packed car, and a Gingerbread latte. When I got home I told Sean I had bought a Christmas present..err, Christmas presents for the house. I didn't have to say anything else, he knew he would be spending his afternoon executing my design plans. Sean had a hair appointment early on in the afternoon and the salon happens to be in the same shopping center as one of my favorite local antique stores to shop. I asked him to stop in to see if he could locate five tiny teacups to hang on the hooks of one of the pieces I purchased. About an hour later he sent me a picture message of five tiny white teacups with gold rims. Part of the decor that I purchased was gold so I knew they would match perfectly; it was meant to be! He gave me a quick call to confirm and mentioned that the teacups came with a complete tea set for $22.00. SOLD! I knew I'd be able to incorporate the other items in the set somehow. Once Sean came home we began getting everything in its place. When it was time to hang the teacups on the hooks we quickly found out that the ball at the end of the hook was too big to fit though the handle of the teacup. I was super bummed. Would you believe me if I told you that Sean broke the handles on each of the teacups, placed them around the hook, and super glued them back together? Because he did! Thank goodness for husbands. I was a bit skeptical at first, but his plan worked perfectly as per usual. Here's a shot of the wall before. I knew I wanted to add simple pieces to add just a little more dimension to the space without overpowering it. ...and after! 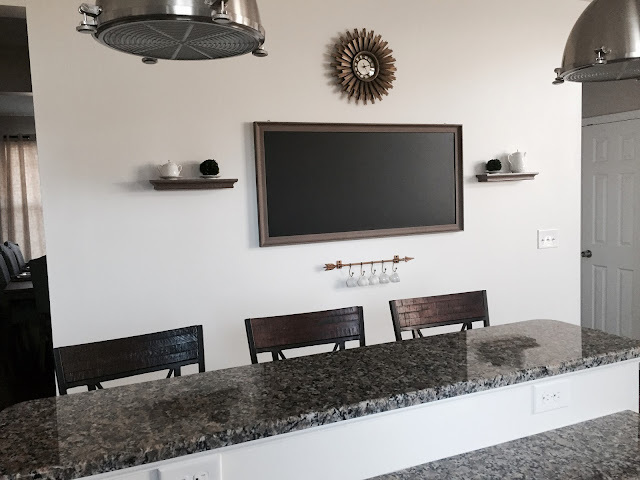 I didn't realize until we got home that the chalkboard is magnetic...amazing. On a whim I grabbed these boxwood poms that are typically used as vase fillers. They added the perfect touch to two of the small saucers.